a.k.a. - "The Big Attack"
Dramatized true-life incidents during World War II and the Korean conflict. in one a paratrooper and another a chaplain). Directed by Charles Marquis Warren - "Defense of St Vinth"
A recruit gets a chance to prove his worth when his company is trapped by Germans. Story of Michigan farm lad, Joe Richardson, who was rushed from basic training right into Battle of the Bulge in Germany. to his company. But in an emergency the chaplain took command and organized the troops to withstand an enemy attack. A man who can forage a chicken from a deserted farm and cook it for his battle weary friends proves that he can fight also. attack to earn himself the nation's highest award. Story of P/fc Fisher who accepted a battle-field commission as American forces moved into Hitler's Third Reich's territory. An Army chaplain shows a medic how to conquer fear through faith. A veteran soldier finds himself on the verge of flunking out of a military academy for non-commissioned officers. Story of student at military academy established by U.S. in Munich to train soldiers to administer conquered nation. The story of Sergeant Fred Richardson - Big Slim - who distinguished himself during the European campaign in World War II. The crew of a Sherman tank are assigned to act as decoys to lure a retreating German division into the open. 14Jul1959 NBC Tue WCSH-TV Boston Mass. Late in the war, a home-front medic is transferred to the battlefields and finds himself looked down upon as a "nursey"
Opener features story of sergeant who helps clear vital road blocked by German tanks in World Word II. A man faces execution for betraying a French underground unit to the Germans, unless an American judge can intervene. Story of a man accused of betraying an underground unit. In real private-eye fashion, the real traitor is smoked out. One of the most decorated companies in the Army, Company K, is ordered to besiege an impregnable German infantry battalion. Dramatization of heroic acts of C.O. Lt. Johnson and his company as they advanced against entire German Infantry Battalion. A French underground unit rescues an American paratrooper who helps them sabotage German communications lines. A young private who wants to assist a German orphanage after the war asks for help from his sergeant, a bitter combat veteran. True descendants of the Rough Riders were responsible for surprise, lightening attacks that did much to confuse the enemy. The story of how a calvary troop surprised a German garrison 50 miles behind their lines will be told in "Rough Riders." Captain Howk's mechanized Cavalry Unit withstands the German lines and maintains control of vital town of Epernay. Written by R.W. Alcorn & Chas O'Neal. A conscientious objector working as a medical aide initiates a strange event when he treats a wounded German soldier. After WWII, two American soldiers try to smuggle German war orphans out of the Soviet sector. A German-born American soldier wounded inside enemy lines is helped by a sympathetic German girl. The Allied attack on the little German town of Hotten which Hitler had ordered to be held at all costs. Three Americans and a British major go behind enemy lines to keep tanks away from the beach where the allies plan to attack. Three American and one British soldier parachute into the center of German positions to prepare for "Operation Anvil." 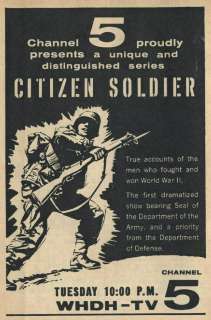 [--] Citizen Soldier (anthology): HARD NOSED M.P. An American commander leads the first attack on German soil in 1944 and delivers an ultimatum to the Germans in Aachen. A select group of paratroopers are sent to England for special training for their part in the D-day invasion. A young French girl jeopardizes herself and her grandparents to help a wounded G.I., in "Dangerous Haven." Five veterans of the war in Europe perform their final mission - to clean out a small town just outside Berlin. Four GIs make a pact to protect the fifth, who is married, when all five are sent to rout out Germans in a small town.